The average Americans support of labor unions crept up this year from an all-time low, but still only slightly more than half favor the existence of labor unions, according to Gallup. 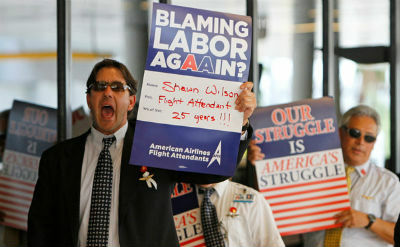 Shawn Wilson, left, an American Airlines flight attendant, at a protest in 2012. The average American’s support of labor unions crept up this year from an all-time low, but still only slightly more than half favor the existence of labor unions.